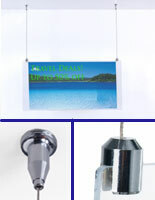 Are you looking for cable hanging hardware to create or customize stylish display signage? 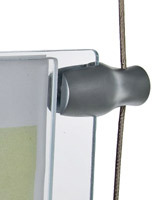 Available in a number of materials and finishes to match any décor schemes, this type of fixture accessory can be used to update existing signs or create new systems as needed. 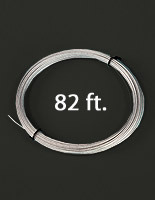 Stainless steel cable hanging hardware ranges from basic wire ropes to wall and ceiling mounted hangers to single or multiple acrylic graphics panels. 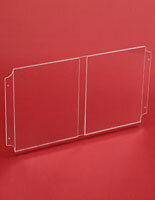 In addition, full picture or sign display kits are also available that include everything needed to showcase one graphic or a matrix-style multi-image grid. 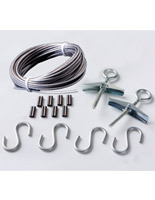 This type of kit-based cable hanging hardware, also known as ceiling mounting accessories, include inter-panel hooks and clamps, ceiling, wall or floor mounts, chain, wire or monofilament and more. Despite the high-tech, modern look of these gallery-style systems, installation is very easy in any format, making them ideal for commercial, retail, professional and even residential use. 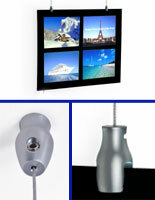 What types of ceiling mounting accessories are offered here? 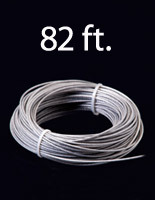 Wire Rope, Chain and Monofilament lines are used to create tension between the top and bottom mounts. 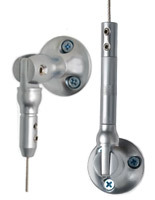 Which type of cable hanging hardware is chosen depends on the desired style as well as the size and scope of the display. 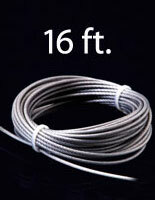 Silver finish stainless steel wire rope provides superior strength as well as offering a clean, modern look. 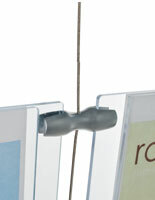 Hanger chains offer increased visibility and visual texture as well as strength and durability. 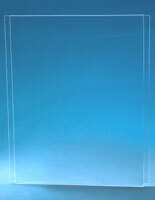 Clear nylon monofilament allows picture or advertising displays to appear as if they float invisibly in mid-air for an elegant, spare style that will capture attention in any environment. 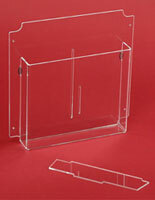 Wall, floor or ceiling mounts vary with the style of each system. 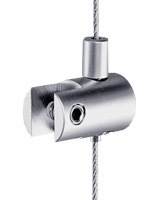 Some stainless steel ceiling mounting accessories are designed to accommodate wire ropes, others for use with chains or monofilament. 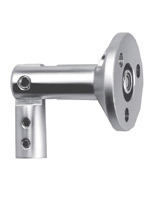 Whether mounted overhead, on walls or floor, hanging hardware is meant to both secure the entire sign to the installation surface as well as to provide tension on the top and bottom of the fixture. 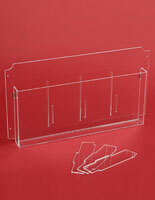 Multi-panel systems require hooks, clamps or grips to attach the clear acrylic graphics enclosures to each other. 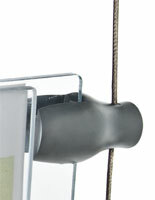 This type of ceiling mounting accessory can be used for attaching the top of one sign to the bottom of another, forming a connection between two panels and a cable or simply connecting sign frames for stability. 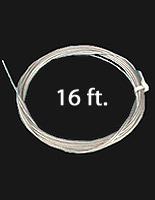 Cable hanging wire display kits are available in many different configurations to match any design choice as well as individual hooks and clamps in a variety of styles. 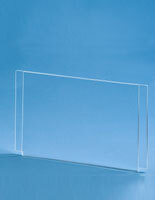 Picture or graphics display frames comes in either traditional clear plastic or electronically illuminated backlit LED lightbox versions. 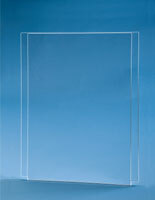 In either style, see-through acrylic provides both secure a secure frame for graphics, artwork or advertising posters as well as an easy connection to other panels in grid or matrix-style systems. 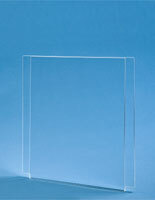 Backlit LED versions can be used with any graphics, although images printed on translucent materials will have the best "glowing" effect for maximum impact when mounted. 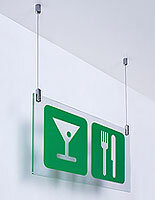 Overhead or wall mounted signage and graphics displays are easy to create using our cable hanging wire display kits and hardware. 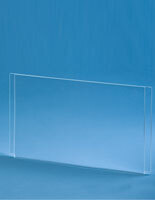 Matrix-style systems are ideal for use in almost any environment, as their modern design complements retail advertising, sales and marketing messaging or simply provides elegant and stylish framing for artwork and graphics. 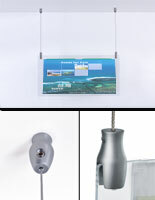 From simple hooks to attach one picture frame to another to floor-to-ceiling mount tensioners for monofilament, chain or wire displays, our huge variety of accessories and hardware includes everything needed to create eye-catching signage and art framing.